I love my bling. Everyone that knows me in real life can attest to it. I don’t think an outfit is complete if not accessorized. And for me, the best accessory is jewelry. I really can’t pick one category of jewelry as my favorite, but I’m quite fond of rings and bracelets, although you’ll never see me out without earrings on. I’ve always fancied myself as a kind of…. trendsetter. My husband calls me a hippie, a lot. But I have a very eclectic taste. I sometimes want to make a bold statement with my jewelry. I love this Les Marres Necklace from Fragments, now talk about making a statement. 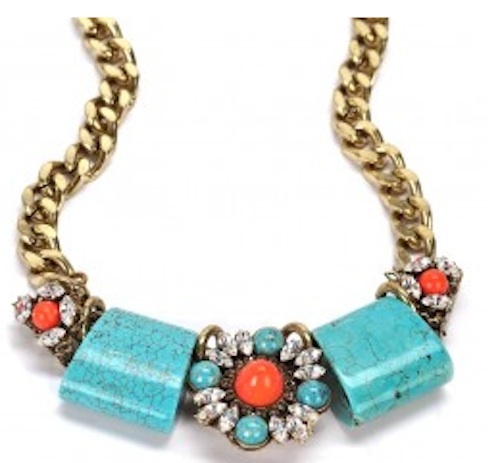 I love the turquoise and coral colors, too. Sometimes I want to be more casual or dress down. But even when I’m not dressed to the nines, I have to have my bling on. I just may be more subtle with my accessories. 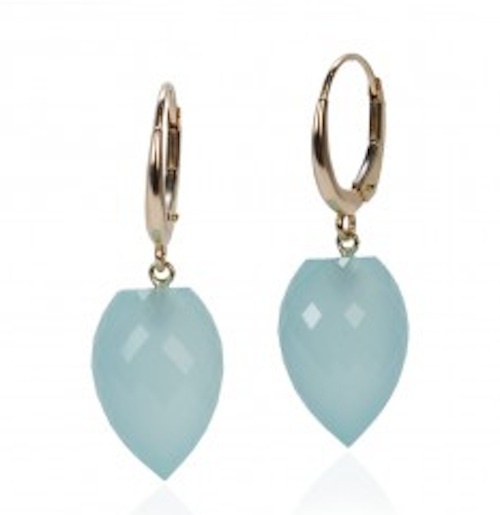 Like these Peruvian Chalcedony Petal Drops. They can be dressed up, but would look great with a pair of jeans, too. Cute right? I always have several key pieces in silver and in gold, because I wear so many different colors, and silver looks better with some colors while gold looks better with others. I found this gorgeous LuLu ring to add to my wish list, just in case my husband reads this (hint, hint). Our jewelry says a lot about us, that’s why your jewelry should be a refection of you. Jewelry definitely tells a lot about your personality. It can be fun and flirty, quiet and understated, bold and beautiful, and, well, the sky’s the limit. Whether you want to make a statement, accent your outfit, or keep it subtle, you will find the right piece of jewelry at Fragments. As well as finding Fragments’ artisans wholesale showroom online, you can also visit their retail store, referred to as a “one stop shop”, “a destination”, and “a jewelry mecca”, at their Prince Street address in SoHo. Disclosure: This is a sponsored post. All opinions are 100% my own and may differ from yours. I will only endorse companies, products and services that I believe, based on my own experiences, are worthy of endorsement. I love all of the pieces that you featured, especially the necklace! I know, isn’t it gorgeous?!?! It’s all gorgeous! But that necklace is a showstopper…so pretty!! These are such cute pieces. I love the earrings. I LOVE statement pieces and things that make bold statements like that. It’s so much fun! I’ll admit that I am stereotypical and like diamonds. Don’t have many, but would always like more. I love that chunky necklace. I really love the lulu ring, that is a cute statement piece! I love jewelry, but my one staple is silver hoop earrings. I love how versatile they are! I love jewelry. I’m totally into big watches and chunky necklaces at the moment. Since my wardrobe tends to consist of so many neutral colors, I especially like jewelry pieces that are eye catching and make a statement. I really love the Peruvian Chalcedony Petal Drops! I LOVE chunky necklaces, though I don’t own many. I need to change that! That necklace is gorgeous! Of course we are huge turquoise fans in my family. The Petal Drops are so pretty! I love those earrings, so simple and chic! I am a pedal drop kinda girl, so I am in love with those earrings! My jewelry is so tame! I’m afraid it might say I’m boring. I’m a simple kind of jewelry person for the most part – but occasionally I like to do it up! My favorite piece of jewelry is my wedding ring but other than that I love wearing bracelets and necklaces. I’ve only recently gotten into jewelry in the last year or so but it can so dress up an outfit. That ring is so pretty! I love wearing fun bracelets and necklaces! I think it really adds a lot of personality! !